The bottom is the resonant head, so damping it will often be more effective than damping the top. It's out of the way of your sticks too. Instead of tape, tryMoon Gel. It comes in handy tubs and just dollops onto the head. Experiment to find where it's the most effective. You may even occasionally want to dampen a cymbal by a small amount - Moon Gel works well here again. Sticky tape on the underside of the cymbal also works, but don't over do it. Remember that it can be difficult to remove. Many designs incorporate damping. Double-ply heads, especially if they are bonded, like Pinstripes, cut out a lot of overtones. Other designs, like Evans Genera Dry, are 'vented' with pin-sized perforations. The holes control decay and focus the sound more. Bass drums are a special case: they usually have a greater internal volume; the head is struck with a fat beater rather than a thin stick. 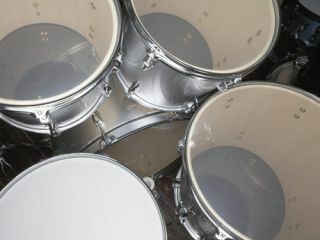 Bass drum solutions range from a felt strip across the head, tucked under the bearing edges, to putting shredded paper inside. Remember that cutting a hole in your front base drum head results in a big loss of overtones and resonance straight off. Drummers still use a small pillow touching the bass drum's batter head. The pillow is best taped down to stop it moving around.